Home body health health news healthy sleep sleep fast sleeping useful TRAIN YOURSELF TO FALL ASLEEP IN 60 SECONDS BY USING THIS SIMPLE TECHNIQUE! 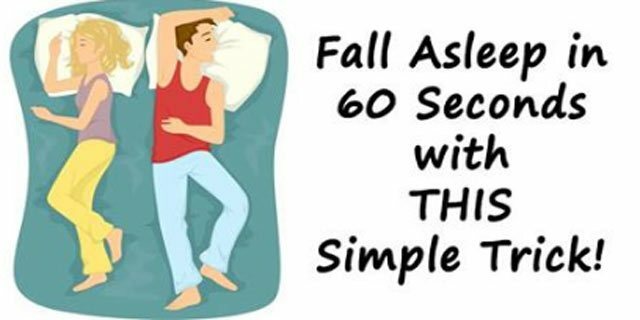 TRAIN YOURSELF TO FALL ASLEEP IN 60 SECONDS BY USING THIS SIMPLE TECHNIQUE! A BIG PERCENTAGE OF PEOPLE ARE HAVING TROUBLE FALLING ASLEEP AT NIGHT. THIS ISN’T ANYTHING NEW A LOT OF PEOPLE ARE HAVING THIS ISSUE. WHEN ARE YOU TRYING TO SLEEP YOUR MIND RACES AND YOU JUST CAN’T GET IT TO SLOW DOWN AND RELAX. Not getting your eight hours of sleep every night can be harmful for your health but it can also reflect on your work and your personal life. Fatigue can kill your productivity at work and It can cause some serious health issues. Chronic sleep loss can put a person at risk for some of the following health issues. Dr. Andrew Weil is a Harvard-educated wellness practitioner who studies breathing, meditation and how both can be used to reduce stress. 1) Breathe out completely through your mouth, and make a whoosh sound. 2) Close your mouth and breathe in silently through your nose and count to four. 3) Hold your breath and count to seven. 4) Breathe out completely through your mouth, and make whoosh sound counting to eight. 5) This is one breath. Now breathe in again and repeat the set three more times for a total of four breaths. This breathing exercise will low the heart pulse and calm your mind. Dr. Weil recommends you to focus on keeping the ratio right and inhaling/exhaling deeply every time.